Tom Block is the producer of the first-ever International Human Rights Art Festival, taking place at Dixon Place March 3-5. 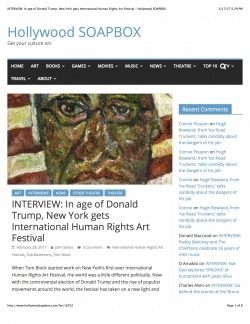 When Tom Block started work on New York’s first-ever International Human Rights Art Festival, the world was a little different politically. Now with the controversial election of Donald Trump and the rise of populist movements around the world, the festival has taken on a new light and new meaning. For Block, an activist painter, author and playwright, the show is less about the Trump era and more about the positive energy that the more than 150 artists can produce. The festival, which is presented by Dixon Place and the Institute of Prophetic Activist Art, takes place March 3-5 at Dixon Place. Block said he knows most of the artists who will perform in works that cut across many mediums. Joya Powell of Movement of the People Dance Company will showcase her work at the festival. Joining her during the weekend of events are playwright Mashuq Deen, playwright Catherine Filloux, musician Ari Gold, Oscar-nominated filmmaker Josh Fox and performance artist James Leonard, among many others. Another performer will be Angela Polite, who Hollywood Soapbox recently featured for her one-woman show Mary Speaks. Block’s own work will be represented with a performance of his play Duck, which follows an award-winning CIA agent who has reached the end of his rope. Rosary Solimanto will present a short piece called The Patient and present her activist artwork about disability identity. Even more impressive is the list of honorary co-sponsors, including legendary TV producer Norman Lear, Sen. Bernie Sanders and several local politicians. Sojourner Truth is the International Human Rights Art Festival godmother and represents the highest ideals of activism. She was an African-American abolitionist and women’s rights activist, who escaped slavery with her infant daughter in 1826. After going to court to recover her son, she became the first black woman to win such a case against a white man. Image courtesy of artist. Block expects to see a wide range of audience members. There may be people who love theater but are unfamiliar with the issues of human rights, while some people may know the issues but are new to the art world. Block is a busy man in the month of March. After the festival is complete, he will gear up for the world premiere of his play Sub-Basement, which will run March 24 to April 15 at the IRT Theater. The piece is a dark comedy that explores the importance of art. And that brings Block back to Trump. The International Human Rights Art Festival is not a direct response to the current administration, but some of the topics discussed at Dixon Place this weekend are surely a bone of contention in society and government. For Block, the connections go deeper and further back. The International Human Rights Art Festival will play Dixon Place March 3-5. Click here for more information and tickets. Tom Block’s Sub-Basement will play the IRT Theater March 24 to April 15. Click here for more information and tickets.